On my christmas wish list this year was a Juicer…. In the past I would use my blender every single day to make a delicious fruit smoothie for breakfast. Now, I use both of them. I will often make fresh juice in the morning and have a smoothie after a workout. Do note that the two machines are not the same beast. The Blender: Can make both creamy and refreshing drinks by adding yogurt or frozen fruits to the mixture. The plus with the blender is that you keep the pulp and fiber of the drink. The Juicer: Makes smooth liquids that are easily digested. These drinks are light and refreshing. The pulp and fiber is removed and you are only left with the juice. I have had my juicer now for about 2 months, and absolutely love it. I did my research when I was looking into purchasing one, and read multiple reviews on different brands. 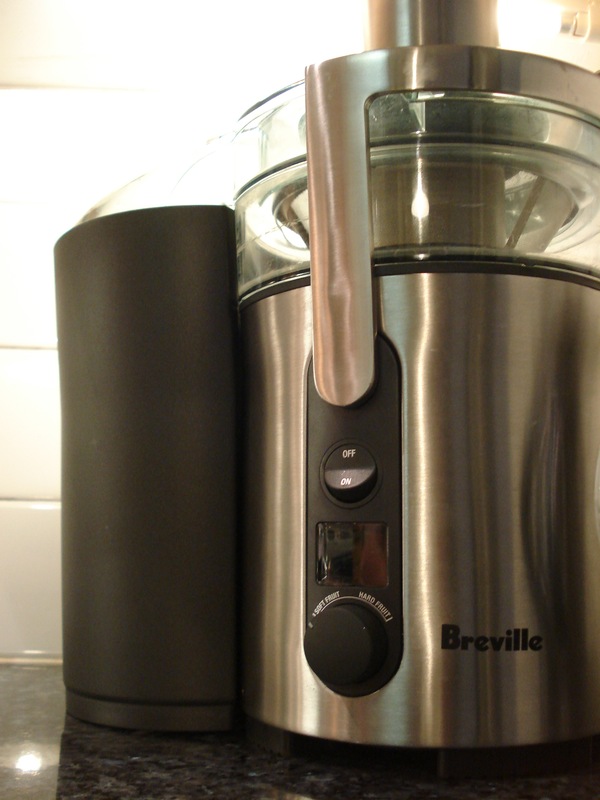 In the end I decided to go with the Breville Ikon Juice Fountain. The juicer is sleek-looking and you can feel the quality when handling the parts. In the noise department, it isn’t much louder than my blender either. The great thing is that you can add just about anything and every juice is unique. It takes practice to know what combinations of fruits and vegetables go well together, but it’s definitely fun coming up with new creations! I have only made one juice that was not that good. It looked like dirt and tasted pretty close too! It was nothing that a few more apples couldn’t fix though. This entry was posted in Food, Life by In Ev's Corner. Bookmark the permalink.